The AWEX EMI rose 59c closing on 2027c at auction sales in Australia this week. The sharp rise was undoubtedly sparked by the news of the South African sale suspension and the import embargo placed on South Africa by China as a result of a foot and mouth disease outbreak. As the Wool-trade digested this news early on Monday morning, the anticipation of the effect on the Australian Wool sales gathered momentum. Melbourne opened sales on Tuesday in isolation, and the result was a 69c rise in the Southern Market indicator, Sydney and Fremantle joined the party on Wednesday and similar rises were experienced as they caught up and surpassed the Melbourne price basis. Merino Fleece shot up early in the sale roster and Sydney maintained the upward trajectory until the market closed, however Melbourne and Fremantle sales finished quite differently with the South Market Indicator losing 16c on Thursday and the Western Market Indicator giving back 41c of its previous days 72c rise. The largest rises were in the 19-22μ MPG’s which added 78-98c for the week whilst the 17-18.5μ MPG’s posted 35-50c rises. On a special note, the 20 MPG achieved a new price record. Merino Skirtings followed the fleece with sharp rises early in the week then plateauing on Thursday. Crossbred continued their upward price trajectory fuelled by the news of South African trade embargoes adding 45-75c pushing 28 and 30 MPG’s to new price record territory. The Merino Carding Indicator added between 32-34c across the centres continuing its slow weekly recovery. From the 42,029 bales offered, 94% cleared to the trade fuelled by the west Australian pass in rate reaching an incredible (and confusing) 12.4%. The trend of the medium micron fleece offering increasing over double the rate of the Fine and Superfine, is directly related to the movement in the micron profile. As the drought progresses, the clip is getting finer putting pressure on the corresponding MPG’s. With the reduction in fibre diameter of the clip, we are also seeing lower yields, staple strengths and staple length of the national clip. This presents some challenges for the exporters and ultimately the top-makers when assembling lots for orders. Futures traded freely this week however whilst the price levels were well below the current cash, the trades were at historically sound levels. 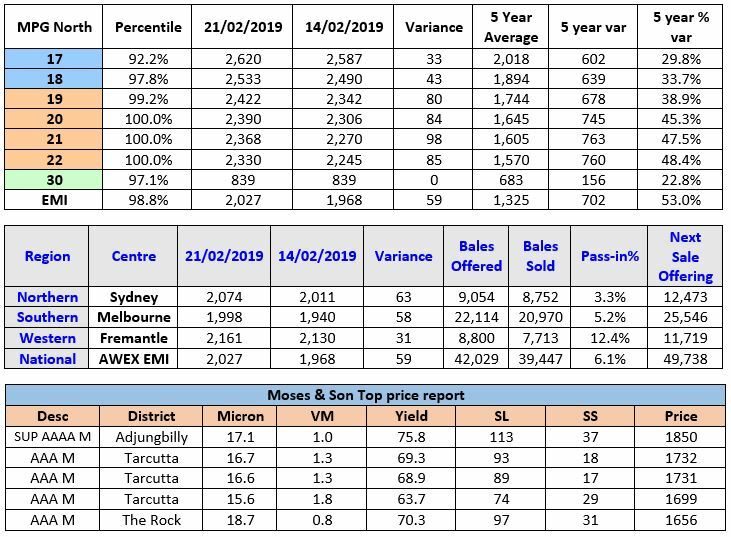 Forward Price Report from Michael Avery (Southern Aurora Wool): Forward activity was highlighted by 19.0 microns trading out almost two years to January 2021 and the continued interest in the spring and summer of 2019/2020. June 21.0 peaked at 2260 and 28.0 microns traded at 1000, a new forward high. Forward levels next week are a little hard to predict. Buyers are expected to be a little cautious having had to absorb another round of record levels at auction. Middle merinos (20.0 and coarser) and crossbreds breeched records set back in September 2018. With 50,000 bales on offer next week the ability of the market to hold at this level will be tested. Supply of good quality medium micron wool will again be limited. The impact of demand destruction, indicated by the poor first half export figures (down 20%), will be the key in the short to medium term direction of both the spot and forward markets. Early indications are that the autumn forward levels will hold around 2280 for 19.0 and 2250 for 21.0 through May and June. Interest on Crossbreds are maintained at 1000 cents for 28.0 and 900 cents for 30.0 microns March through June.